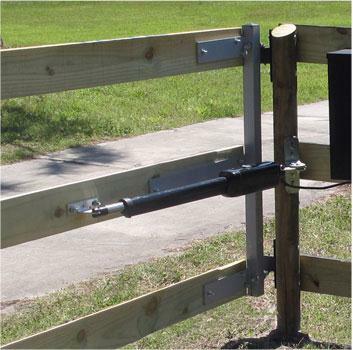 The Estate Swing brand offers a wide variety of automatic gate openers. From residential driveway gates to farm fence gates and even light commercial entry points, there is an Estate Swing operator to fit the needs of almost any property. Whether single, dual, swing or slide, Estate Swing has successfully brought automation to gates across the U.S. and worldwide. As a premier gate opener brand, we offer solutions for residential aluminum driveway gates, chain link gates, panel gates, tube gates, wrought iron gates, wooden gates, vinyl gates and more. Many of our gate opener product lines fill a need for a specific type of gate. View the enclosed list to see each series and their corresponding benefits. The HomePro Series tag line expresses “gate openers built to professional standards" because the openers are capable of automating heavier gates with a constant duty, low voltage design, and versatile mounting options. Models include: ES 1600, ES 1602, ESU 2200, ESU 2202, ESL 1800, ESC 1600, ESC 1602. The Featherlite Series "Floats like a feather, works like a champ" because it is most often applied to lightweight gates (such as vinyl gates) that require automation without the force of a high-powered opener. Special built-in settings work with the gate to promote ease of opening and closing. Models include: ES 1100, ES 1102, ESC 1102, ESL 1200. The Solar Series allows for the automation of residential gates by either plug-in charge or through solar panel connection. This special design allows for the lowest standby draw of any DIY solar gate opener control board on the market today (under 10mA). Models include: E-S1000H, E-S1000D, E-S Allegiant. Safety is our number one priority. During the design process, we informed our engineers that safety measures are of the highest importance. Therefore, all of our automatic gate opener safety measures function on a normally closed circuit, which prevents the automatic gate from opening when the safety measure is not operating as it should. Other electric gate openers function on a normally open circuit, which allows the gate to open even when the safety measure is not operating properly; this could result in damages or even serious injuries. We find this inadequate for our standards, so we use the normally closed circuit design for Estate Swing gate openers . *These functions vary by model. © Copyright 2002 - 2019 Sequoia Brands, Inc.